Accessioned in three parts, from 1978 to 1982, this collection has not been fully processed. The following brief biography is available, along with preliminary inventories and extended biographies, all compiled by Caroline E. Werkley, Eiseley’s long-time Secretary. Loren Eiseley was an American anthropologist, educator, philosopher, and natural science writer. A Nebraska native, Eiseley earned his PH.D. from the University of Pennsylvania in 1937 and returned to Penn in 1947 as Professor, Chair and Curator of the Department of Anthropology. From 1959 to 1961, Eiseley served as Provost of the University, and from 1961 until his death, he was Benjamin Franklin Professor of Anthropology and History of Science. 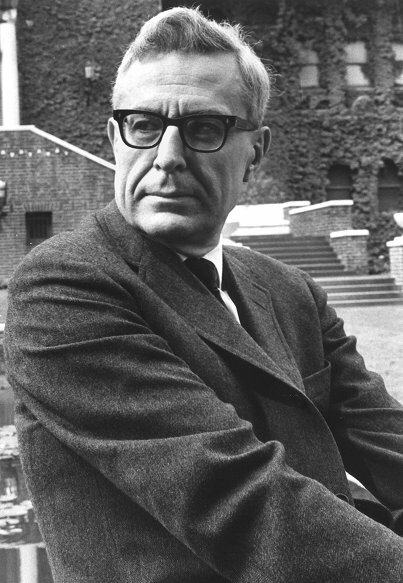 From the 1950s through the 1970s, Eiseley published and lectured widely on diverse topics, earning a national reputation as a scholar of uncommon creativity and literary ability. He was honored with 36 honorary degrees and was a fellow of many distinguished professional societies. Werkley’s report provides not only information about the provenance of the collection, but also rich biographical and bibliographical information about the author. We have therefore attached it here for researchers’ reference. As the original inventory was not finalized in certain sections and the inventory itself is long and involving, some technical adjustment was made in its format when the inventory was converted into digital form in 2001. As Eiseley willed, the copyright of all his published works has been transferred to the University of Pennsylvania and has become the University’s property. Files for each letter of the alphabet, A through W and one for X,Y, and Z. Answer to Ashley Montague (notes) Loren Eiseley Coll. 1969: An Alternative to Technology (Time and Technics): 20 page corrected typescript of an L.E. talk; ) 3 page typescript w/notes (corrected by L.E.) etc. 1937: “Index Mollusea and their Bearing on Certain Problems of Prehistory: a Critique” — part of Ph. D. thesis. 1937: “Indirect Indices of Quaternary Time and their Bearing on the Problems of American Prehistory” A Critique–prospectus of Ph. D.
1960: “The Naturalist Believes” lecture at University Pitt. 1954: “Program on the Darwin Collection for the Library” Proceedings of the American Philosophical Society. 1959: Forerunners of Darwin. Bentley Glass, ed. 1972: The Endless Adventure. Dale R. Coman. Intro. by L.E. Interviews with Eiseley on tape: Heyward Hale Braun, 1975; Richard Stonesifer and Luther Binkley, 1960. Nebraska Hall of Fame Induction, 3 September 1987. Letter: James W.T Moody, 9 September 1971.